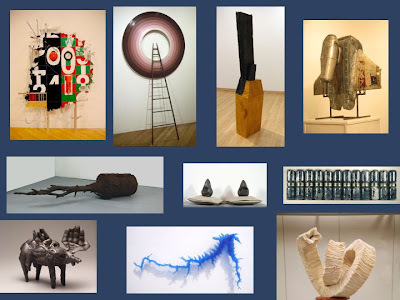 The Marlboro Gallery National Juried Sculpture Exhibition at Prince George's Community College features 21 artists from around the country (including one of DC's top creative sculptors: Adam Bradley). My good friend Kristen Hileman, Associate Curator at the Hirshhorn Museum and Sculpture Garden juried the show and will present awards during the reception on my birthday, September 6th, 4 – 7pm. The exhibition and cash prizes totaling $3500, including the $2000 Kari Beims Sculpture Award for Best in Show, was made possible through a generous donation from an anonymous patron of the arts. I hear that Kristen put together a really interesting show and sounds like a really exciting even because the venue has been able to give sculptors place where they can show some substantially large work, and give away some significant monetary prizes. One of the judges of Australia's top religious art competition has resigned in vehement objection to a work that has been included in the finalists' short list. 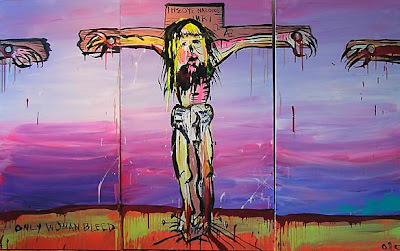 Australian art critic and historian Christopher Allen resigned from the panel of judges after Adam Cullen's triptych Corpus Christi made the short list for the $20,000 Blake Prize for Religious Art. Corpus Christi depicts Jesus on the cross with the inscription, "Only women bleed," a line from a song by rocker Alice Cooper. Allen told ABC Radio that he did not like the painting, which he said "has a kind of deliberate ugliness that has been exploited as a gimmick." Art fairs have already proliferated to such an extent worldwide in recent years that they have begun to kill one another off. Read the SF Chronicle story here. A new trend in the art business is flourishing at a moment when the economy is tight and sales are slow at galleries around town. What's the idea? Add a bar.